We have posted on the Blog about the Breithaupt Park rehabilitation effort. We appreciate the suggestions different people have made and the city has gone through them and has approved a few (they happen to be the suggestions that cost the least amount of funds). In the picture above you see city workers have trimmed branches from a spruce tree and put a couple of picnic tables underneath. 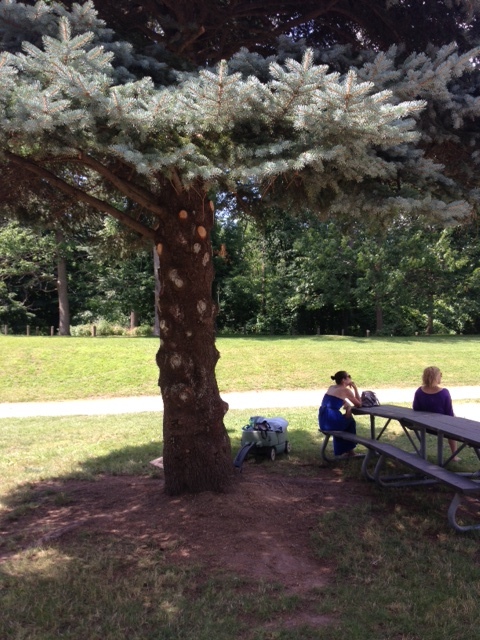 This allows families to use the park and have lunch or a snack in the shade. This did not cost very much and encourages use of this green space. The city is also committed to clearing and marking the trails in Breithaupt Park so walkers and cyclists have a much better idea of where they can go. Stay tuned as we show how other “inexpensive” ideas can make a difference. "Lighter, quicker, cheaper" is the catch phrase of the Project for Public Spaces (www.pps.org). Great work neighbours! Keep the ideas going.